I was looking for some new breakfast dish, as I got a little tired of warm oatmeals, millet or quinoa breakfasts recently. I felt like something cool in the morning: plain yogurt with fresh fruit was good for a start, but it needed some hearty crunchiness. I went to try homemade granola. I never made it before, I only knew the ready made ones from the supermarket. They didn't tickle my fancy. 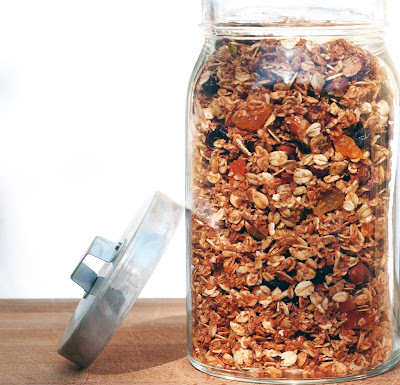 Now this is my first homemade granola. I would have never thought what difference it makes. It is so much better when it is freshly made. Just the fragrance of it is so convincing that I will never ever buy ready made muesli again. It's so easy and fast to make. I am usually well equipped with all sorts of grains, nuts, seeds and dried fruit. For the granola, I had all the ingredients at home and decided to give it a go with coconut and cranberries. It gives you lots of opportunities to mix in whatever you fancy: e.g rolled spelt, various other dried fruit, any nuts you like. Preheat oven to 180C. In bowl, combine oats, wheat bran, coconut and almonds. Spread the mixture onto baking sheet and bake for 8 minutes in preheated oven until lightly toasted. Transfer back to a bowl and let cool. In a saucepan combine coconut oil, vegetable oil maple syrup and honey. Cook over medium heat until it comes to a boil. Keep stirring. Boil for a couple of minutes. hen add the vanilla extract. Pour the syrup over the oat mixture in the bowl and stir until evenly coated. Spread the mixture onto a baking sheet and bake for another 8 minutes, or until fragrant. Let cool, then stir in the dried fruit.